The Harker Forensics team had a record-setting weekend at the National Debate Coaches Association Championship at Weber State University April 11-14. The speech and debate team won national championships in three out of the four events at the tournament! 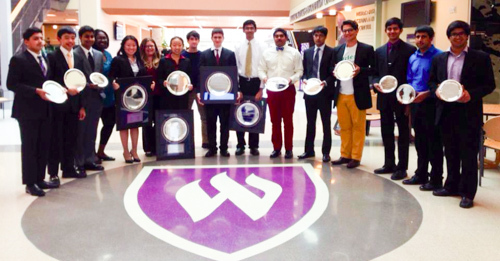 Eight students went home with titles in three categories: Lincoln-Douglas, Public Forum and Congress. Pranav Reddy, grade 11, won first place in Lincoln-Douglas debate; Misha Tseitlin, grade 9, placed first in Congressional debate; and Jasmine Liu, grade 10, and Kevin Duraiswamy, Arjun Kumar, Stephanie Lu, Sreyas Misra, and Sebi Nakos, all grade 12, were co-champions in Public Forum debate. “We’ve had different parts of the program win a title before, but we’ve never had this much overall strength all at once,” said Jenny Heidt, debate coach. More than 300 students from states throughout the nation participated in the tournament. Harker sent 26 upper school students to compete. To qualify for the national tournament, students had to do well at various debate tournaments throughout the invitational season. The team has several more important tournaments coming up at the end of the 2013-2014 season, including travel to Kentucky, Illinois, Kansas and Texas.